Columbus, OH - "Metro Parks plans to begin work this year on a mile-long section of the Olentangy Trail in Delaware County. Columbus, OH - From centralohiogreenways.com, "There will be construction occurring along the Olentangy Trail in the OSU section between Herrick Drive and King Avenue from January 7th thru January 31. "The trail will not be closed. A temporary bypass path will be provided around the work site." Columbus, OH - From centralohiogreenways.com, "...A majority of the [Worthington Hills] shopping center including the trailhead parking area has been fenced off for construction. From columbusunderground.com, "Two major upgrades are planned for the Olentangy Trail: one that will widen a large section of the trail and another that will connect it to Bethel Road for the first time. From centralohiogreenways.com, "As early as Monday (1/29) and continuing through mid-February, the Olentangy trail will be impacted between Woody Hayes Drive and John Herrick Drive for soil borings occurring in the area. Facilities: In the parks along the trail. 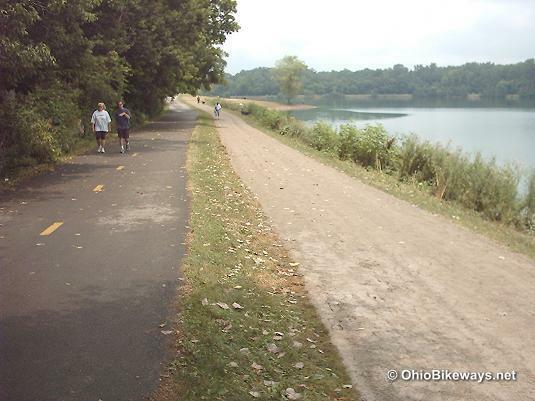 Worth Noting: The Olentangy Trail can be used as an alternate route, in the event of a trail closing along the Ohio-to-Erie Trail portion of the Alum Creek Trail. 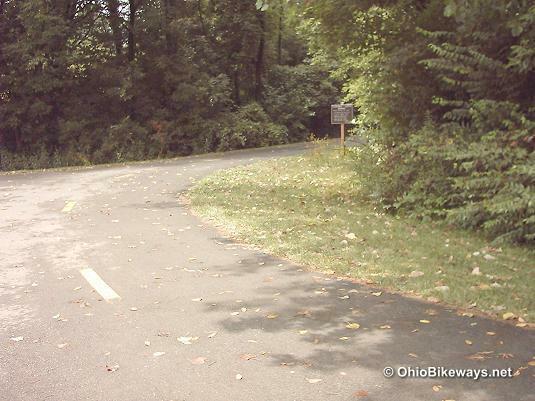 The Olentangy and Alum Creek Trails are the 2 major north-south bikeways in Columbus. Both follow waterways and both play(ed) a role in the cross-state route of the Ohio-to-Erie Trail. The Olentangy served as the interim route of the OTE until the completion of the Alum Creek Bikeway in late 2015, when the route was moved over to Alum Creek. The Ohio-to-Erie Trail uses existing trails to connect Cincinnati with Cleveland, by way of Columbus, OH. Highlights along the Olentangy Trail include OSU Stadium and several parks. Though much of the trail has been updated and is in very good condition, some sharp corners and congested areas make speeding along the trail risky business. The surface varies from asphalt to concrete which includes some sidewalks. My first trail ride through a dense urban area -- years ago -- was on the Olentangy and Lower Scioto Trails. It's one of those memories that's etched firmly in my mind. Despite carrying a small map with detailed directions, it took almost 2.5 hours to ride 18 miles of trail. A myriad of connecting spurs, short road rides between completed sections, and trail gymnastics (twisting, turning, backtracking), along with virtually nonexistent signage, made for quite an adventure. Today, well-travelled trails like the Olentangy are better connected and typically have wayfinding signs to help keep riders on route. But that doesn't mean you won't get lost. It's a meticulous task to accurately sign or mark every spur. So, though the trail should be easier to navigate today, you should still carry a map or trail app. Do your prep work before you trail ride here, or recruit a local rider to show you around!